The storeowner rearranges things on the counter and hides his cell phone in the pocket – just in case. 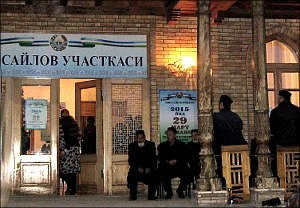 A visit to polling stations in Tashkent instantly refutes stereotype about Uzbeks’s indifference to politics. Voters flock incessantly to polling stations despite a chilling wind and an unexpected snowfall in Tashkent. People are voting, and not just the ever-active pensioners: the young, the middle-aged, entire families, some with small children. They register at the desks with lists of names, show their passports, receive ballots and walk into curtained booths to put the plus sign—or a cross— next to the name of one of the four presidential hopefuls. However, a very cautious survey —cautious, of course, lest the interviewer wants to be turned over to the ubiquitous plainclothes and police in green uniforms who throng the city today— unveils a totally different attitude. For instance, few are aware that today is the election day. Some were surprised to hear Karimov needs an election at all. Most refuse to speak or frighteningly start assuring that there could be no better candidate. But their darting eyes prove they are lying. The key word in today’s elections is fear. Fear of the known and a greater fear of the unknown. The state instils fear in everyone; fear has become part of the common psyche, turned into a collective Stockholm syndrome. Those who do have the courage to say something echo each other. Several others repeat the-lesser-of-the-two evils philosophy and cannibalistic metaphors. Yet, at the same time, they enjoy talking about how friends and relatives succeeded in Moscow, Almaty, Seoul or New York. One cannot chose one’s Motherland. Let alone its head. Fear of the unknown is worse. Stronger. Gloomier. And it’s not about a distant theoretical possibility that the caricature-like hopeful named Ketmonov could seize the power. It’s about today’s world where the new is not necessarily the better. Muhammad Salih, the main opponent of Islam Karimov to date since the elections in 1991. Many people still remember Afghanistan and intrusions of the Islamic Movement of Uzbekistan in late 1990s. The horrors of Tajikistan’s civil war. Some made conclusions about the outcomes of the Maidan uprising in Ukraine or the Arab Spring, that were followed by chaos, wars and decline. They understand that the known, habitual evil is easier to get along, to make deals with, and the known evil’s emissaries could be bribed if everything else fails. Those very emissaries, in the meantime, could not be more indifferent—they show a fatigued, serious and sincere indifference. They only need to play a small role that does not require a dramatic transformation or method acting. And they get their share of the pie for playing the role. Some play a diligent policeman, a plainclothes snitch, an official on TV who recounts the number of foreign election observers, or that very candidate Ketmonov, who plays the candidate Ketmonov. These “actors” play for the chance raid, misappropriate and embezzle, get bribes or kickbacks, or to run a business on the side without inspections. They can now openly park their second new cars overnight on the street by their new houses. These are the three proverbial whales—fear and indifference in exchange for dishonour—that Karimov’s regime rests upon. These whales will prop the regime for several more years to come, because the pyramid of this society has been put together and has petrified. Karimov will remain president for as long as his health and grip on power serve him, because such long-serving “fathers of nation” only step down from the throne to be put into a coffin.